4. Minister of Civil Aviation: Samir Imbabi, former adviser to the minister of civil aviation. 23. Minister of Military Production: Aly Sabry – held this post Essam Sharaf and Kamal El-Ganzouri's cabinets. 29. Minister of Sports: El Amry Farouk – businessman; member of the famous Ahly Club board. NDP cadidate for 2010 parliamentary elections. 31. Minister of Tourism: Hisham Zaezou – served as minister of tourism in the 1990s; senior assistant to tourism minister Mounir Fakhry Abdel-Nour in Essam Sharaf's government; head of the Egyptian Tourism Federation 2004-2007. I don't care what their religious or political backgrunds are, I just hope that they are honest and love this country enough to do what is best for us all. We should all work hard to get Egypt back on track. Start with yourself and others will follow. For a start , let us stop throwing trash in the streets ..... How hard is it to keep a plastic bag in your car and use it for trash. Think about it, do it and teach your children to do it too. This is the only way to move ahead. It is unblievable. 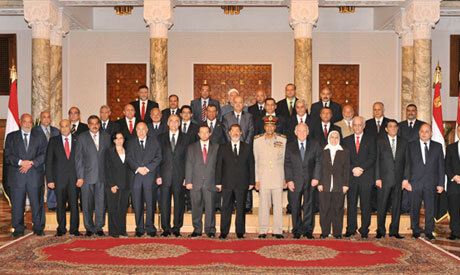 The new cabinet contains just Moslems (Brotherhood)???. Where are the christians as promised eatlier. This is not the way it should be for a successful administration that present all relegions in the country and have place for minorities. Any christians ministers in this government? Is it by accident or meant? Most of them are either Ekhwan or Ekhwan supporters. But is it meant that the following ministers are from Ekhwan: Information- Education - Higher Education - Justice - Youth - Manpower- Housing - Industry and Trade. What is going on? Why Education , Higher Education, Youth , Information, Manpower and Justice ? I will leave the answer to the readers. Yes it will proove that brothers are the other side of the same coin. Who like not the brothers was doing deals w Sadat and Mubarak? The big surprise is that Ahmed Shafiq is the Civil Aviation Minister in thew new cabinet!!! well, not really, i just made that up!!! When will they announce the Minister of Civil Aviation? Where is Mr.Essam Al-Arayaan, I was looking to see him as a famous Minister ?